Halftone, as the name implies, is inspired by the printing technique, which here creates pattern and depth in the two-dimensional surface and contributes to variation and structure. 595 x 595 mm. Painted metal. White RAL 9010 or grey RAL 7030 , other colours on request. System power: 32W. 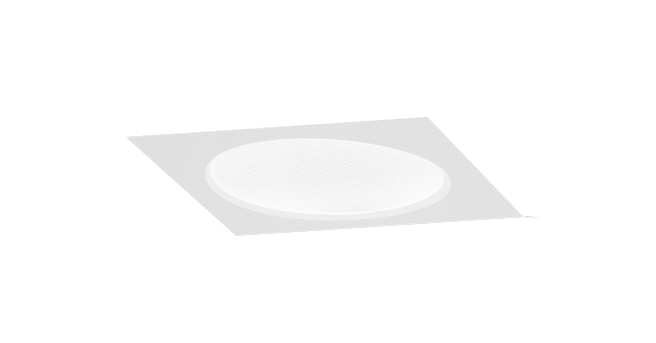 Luminaire Luminous Flux: 3740LM/Square opening or 3166LM/round opening. CCT 3000K or 4000K. SDCM 3. CRI <80. Recessed in falce T-profile ceiling. Fits both hidden and visible T-profile ceilings.